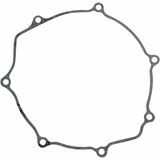 Rideorrun - Charleston great purchase price "this clutch cover gasket is made better than oems. Great price as well." MotoEnthusiast - Tennessee, USA Good fit. "It's a well cut gasket and holds oil good so I'm happy."